Designed to mirror the 2011 exam format, this book is an essential study tool for the Edexcel IGCSE in English as a Second Language. 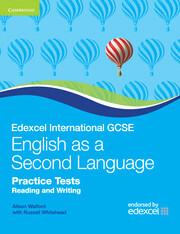 This indispensable book contains four complete practice tests to help students prepare for Paper 1: Reading and Writing of the Edexcel (London Examinations) IGCSE in English as a Second Language. The tests are designed to mirror the new 2011 exam format, using the actual rubrics and question types, so students can practice the kinds of exercises they will complete in the real examination. Teachers will find Edexcel IGCSE English as a Second Language: Practice Tests, Reading and Writing an excellent source of practice material which will engage students' interest at IGCSE level. Each test includes six parts (as in Paper 1 exam papers): Parts 1-3 contain reading questions; Parts 4-6 contain writing questions. The reading questions include various exam question types, so students can practice each one: multiple choice, multiple matching, short-answer questions, sentence completion, note completion, True/False and Yes/No questions. The reading questions are based around authentic texts from international sources, including short advertisements and longer pieces such as newspaper articles. The writing questions give students practice in producing formal, semi-formal and informal pieces of writing in the appropriate formats (as in the actual exam); these include reports, articles, letters and summaries. Endorsed by Edexcel, Edexcel IGCSE English as a Second Language: Practice Tests, Reading and Writing is an essential study tool. Key information about the Edexcel IGCSE Paper 1 examination. Specific advice for students on how to approach each part of Paper 1. Completely up-to-date exam-style questions, tailored to the new 2011 Edexcel IGCSE specification and exam paper format. A wide range of stimulating texts and contexts selected to appeal to IGCSE students. A removable answer key containing answers to all questions, for ease of reference. Model answers to the writing questions.